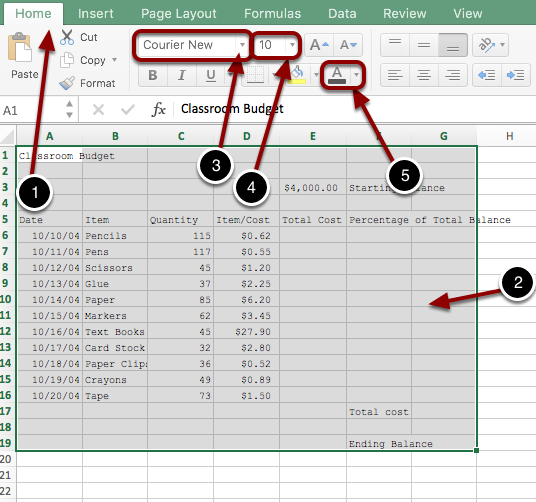 EdTech Help GuidesED206 Excel TCAHow Do I Complete The Practice Excel TCA? 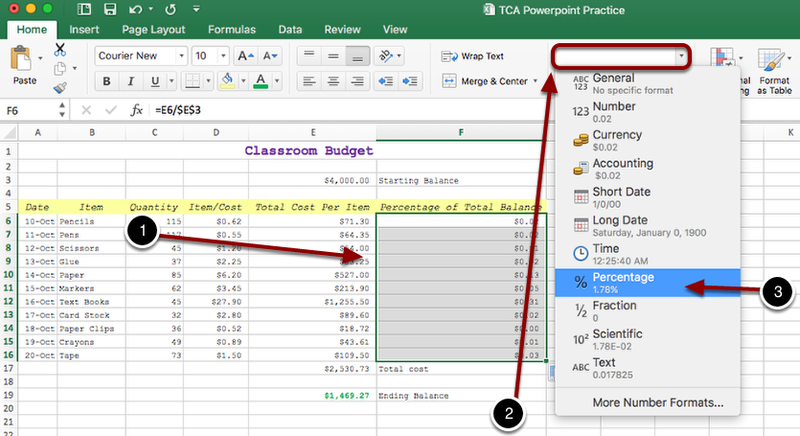 Below will be step by step instructions on how to complete the practice excel TCA. During the test you will complete the skills shown below. 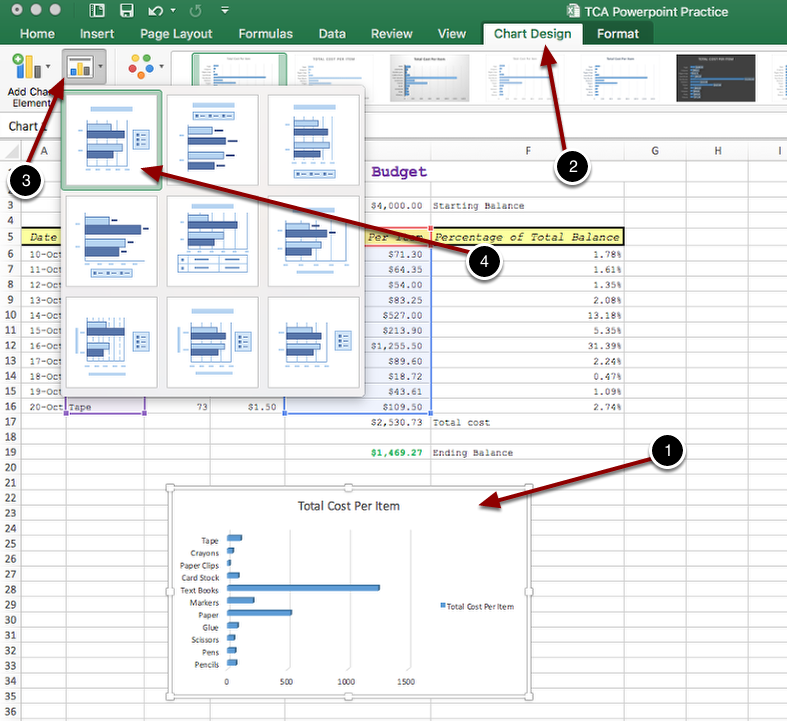 We recommend you go through this practice to familiarize yourself with the excel TCA. 2. Right click and select copy (or use "command c"). 1. Click into cell A1. 2. Right click into the cell (or use the keyboard, selecting the command key and the v key). 1. Select the home tab. 2. Highlight all of the data from A1-F19. 3. Select which font you want to use, using the icon shown above. 4. Select the size you want to use. 5. Change the color of the font by selecting the icon shown above. (An A with a line underneath). 2. Click into cell A1. 3. Select the size you want to use, using the icon shown above. 4. Select the bold button. 2. Highlight the data from A1-F1. 3. 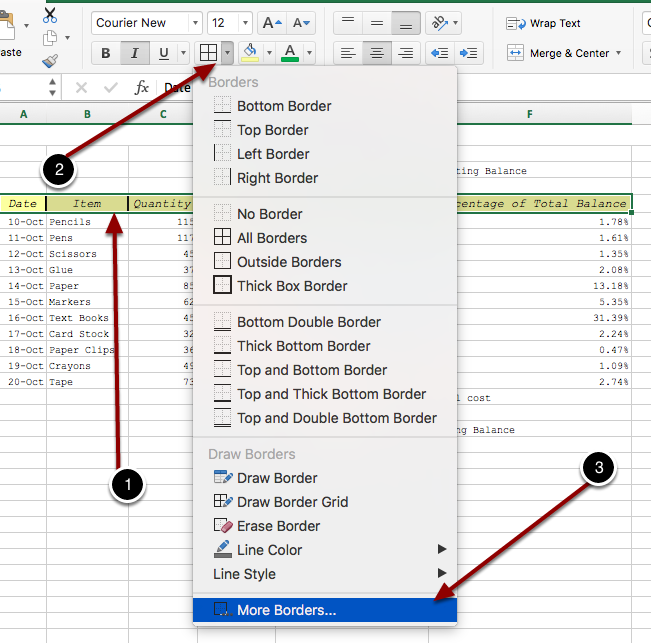 Select the merge and center drop-down box. 4. Select the merge and center option. Format the headings in Row 5 to Courier New 12 pt. black, italic, centered. 2. 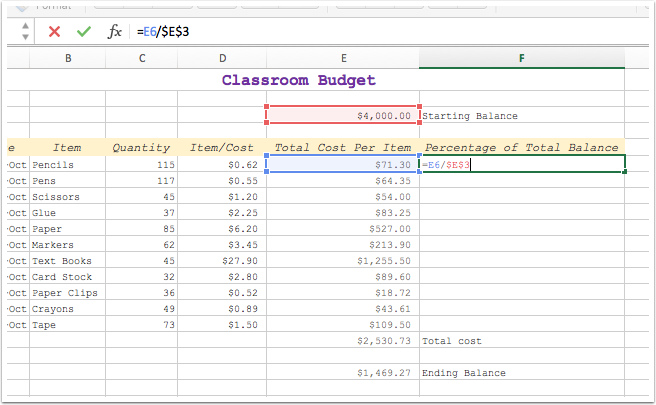 Highlight the data from A5-F5. 3. Select the italic button. 4. Select which font you want to use, using the icon shown above. 5. Select the size you want to use, using the icon shown above. 6. Select the center text button. 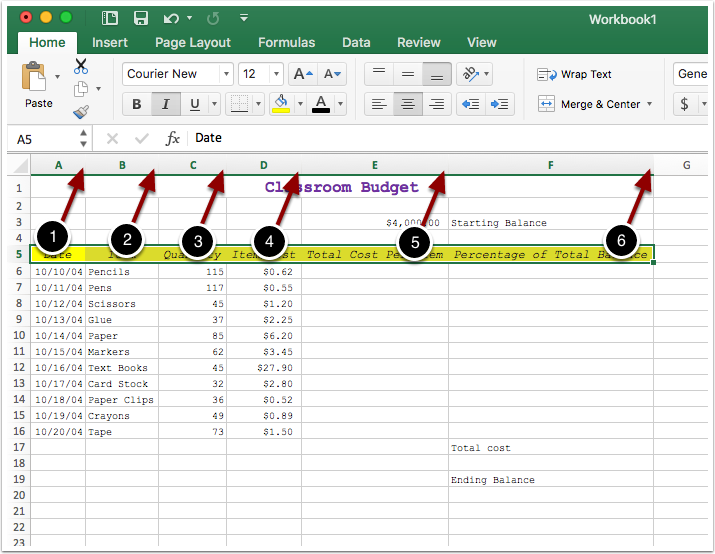 Add a light yellow cell background to the headings in Row 5. 1. 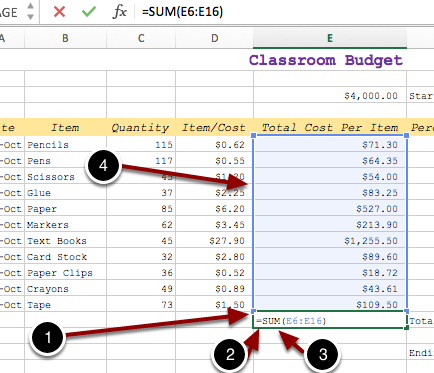 Highlight the data from A5-F5. 2. Select the fill color button, using the icon shown above. 3. Select the color you want to use. The color does not have to be the exact shade of light yellow shown in the example above. 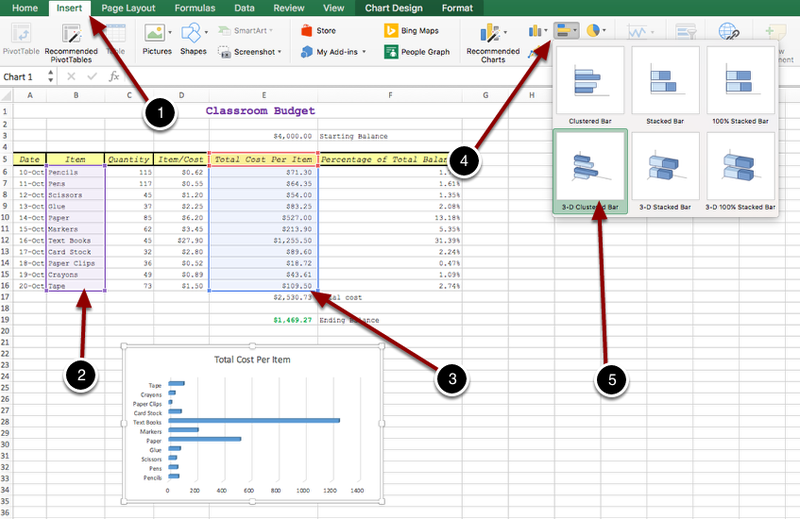 It should, however, look as close to the final excel project as possible. 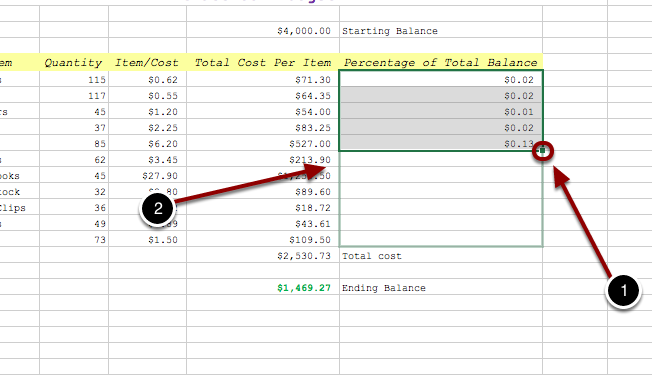 Adjust the column width to fit the data. 1. Double click in between A and B as shown above. 2. Double click in between B and C as shown above. 3. Double click in between C and D as shown above. 4. Double click in between D and E as shown above. 5. Double click in between E and F as shown above. 6. Double click in between F and G as shown above. 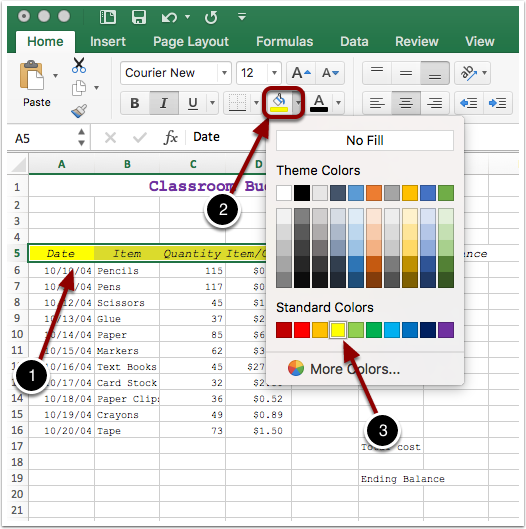 Format the dates in the cells in Column 1 to show day and month as shown in the example. 2. Highlight the data from A6-A16. 3. 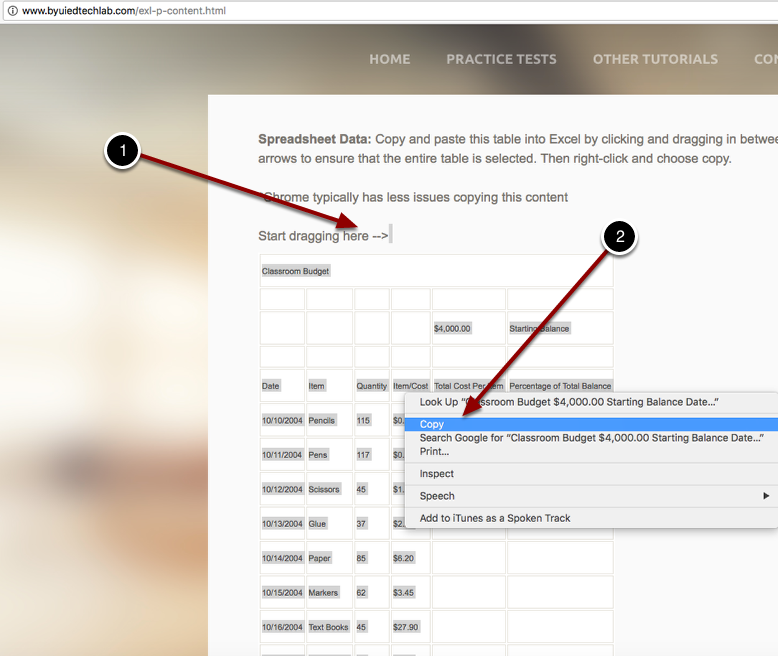 Select the number format drop-down box as shown above. 4. 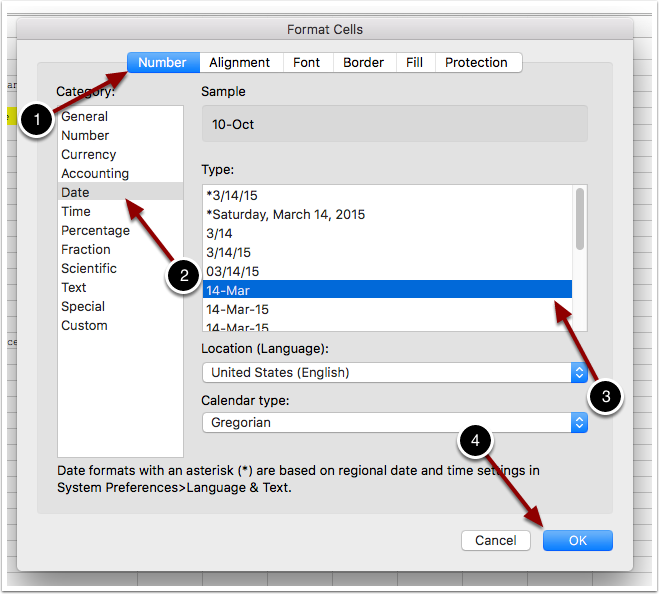 Select the more number formats option at the bottom. 1. Select the number button. 2. Select the date option. 3. When this box appears, select the date format you want to use. 1. Click into cell E6. 2. Start a formula (or function) by inserting an equal sign (=). 3. 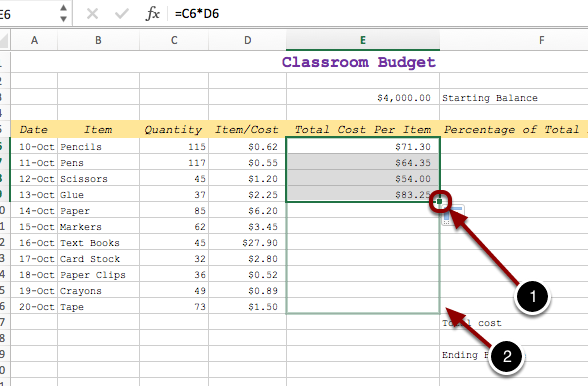 Click (or type) what cell you want to use in the equation. To find the cost of pencils click cell C6. 4. 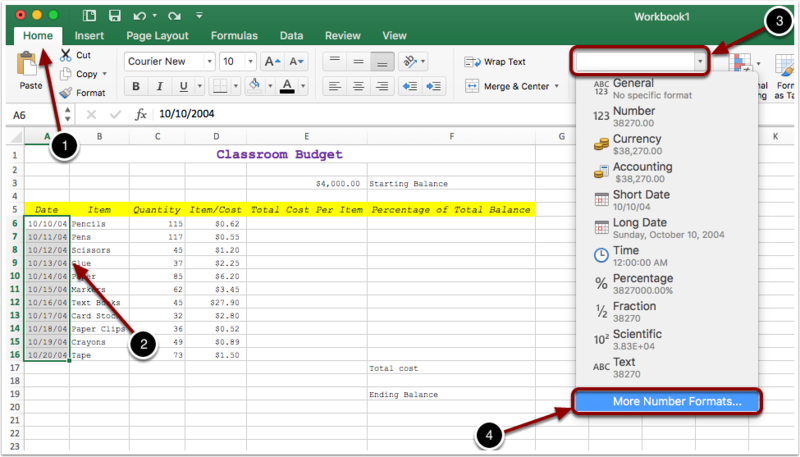 To multipy the numbers in two different cells, insert an asterisk (*). 5. Click (or type) the cell you want to muliply. 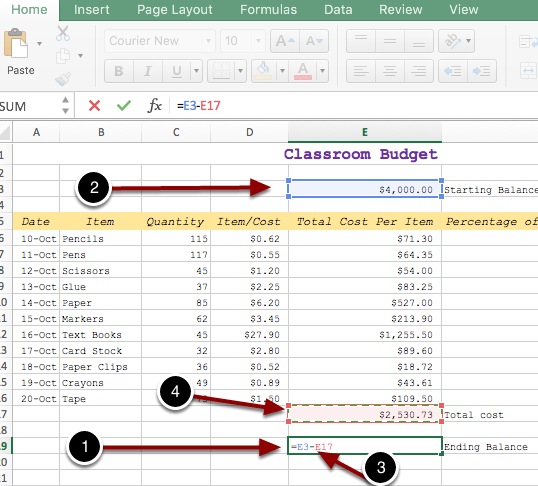 To find the cost of pencils click cell D6. 6. Once your equation is complete, press enter. You can see the equation you entered in the box shown above. 1. Click on the green square in the corner. 2. Drag the square as far down as needed. 1. Click into cell E17. 2. Insert an equal sign (=). 3. To use a function, start typing SUM after the equal sign. 4. 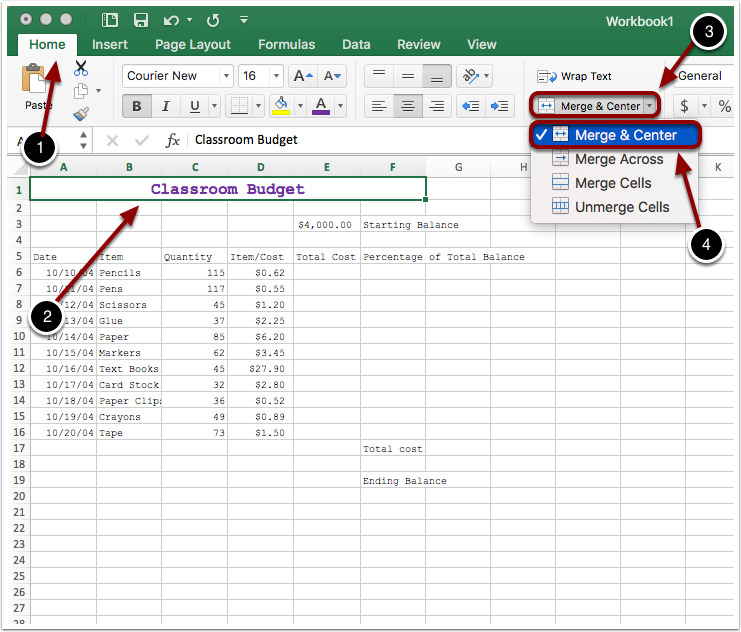 Click and drag for whatever cells you want to use in the function. 1. Click into cell E19 and enter an equal sign (=). 2. 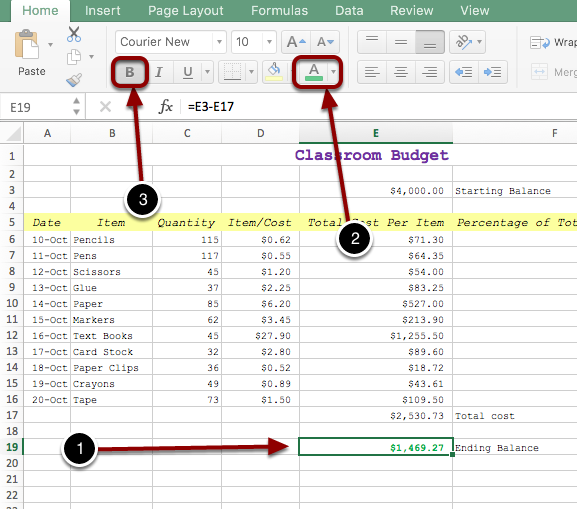 Start your equation with $4,000 by clicking into cell E2. 3. Enter a subtraction sign (-). 4. Select E17 and click enter to find the ending balance. 1. Click into cell E19. 2. Select the icon shown above to change the font color. 3. Select the icon shown above to bold the font. 1. 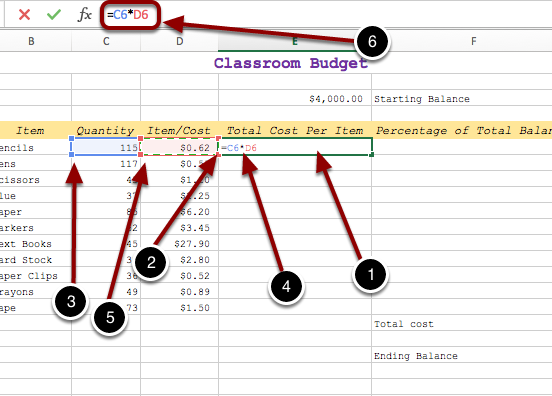 Click into cell F6 and enter an equal sign (=). 2. Click into cell E6. 3. Insert a slash symbol (/) to represent division. Notice in the image that I entered money signs into the equation. 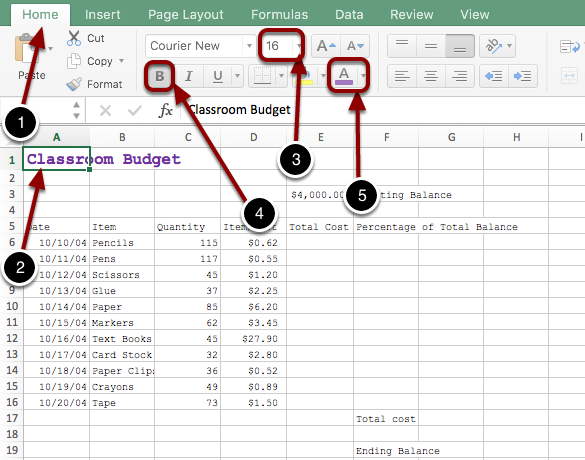 If you want to keep a specific cell in the equation the same even when you apply it to other cells, entering the money sign allows you to do so. 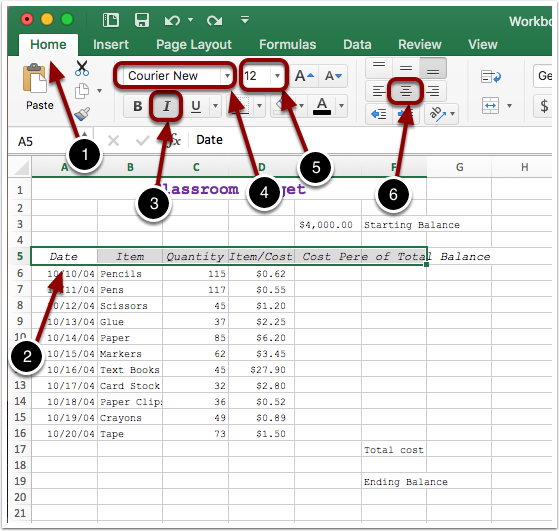 Enter ($) then the column letter, then ($) and the row number. 1. Click on the small, greeen square in the corner. 2. Drag the square down as long as needed. 1. Highlight the data you want to change. 2. Select the box shown above. 1. Highlight whatever data you want to change. 2. Select the image above to add more digits after the decimal point. 3. Select the image above to remove digits after the decimal point. 1. 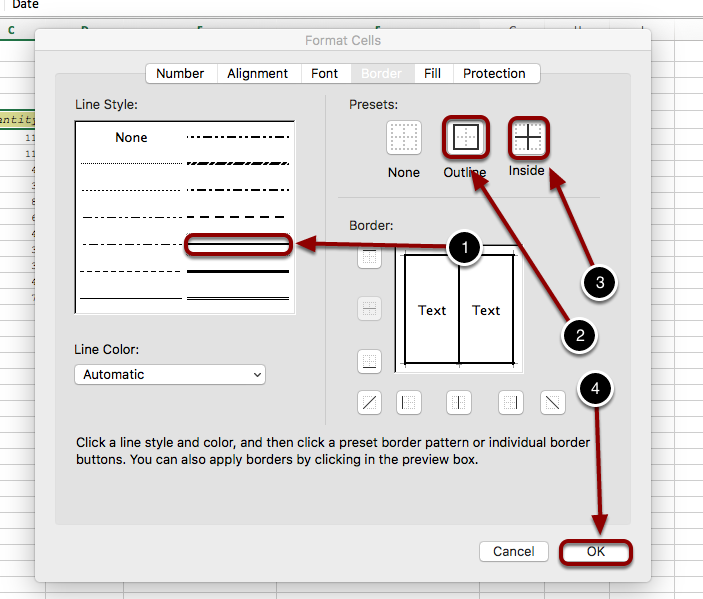 Highlight the cells you want to border. 2. Select the down arrow on the border icon shown above. 3. Select "More Borders..." option at the bottom of list. 1. Select the type of line you want to use. 2. Click on the outline button. 3. Click on the inside button. 1. Select the insert tab. 2. Highlight data from (B5:B16). 3. While holding down the command key, highlight data from (E5:E16). 4. Select the chart icon show above. 5. Select the 3-D Clustered Bar graph. 1. Click on the graph. 2. Select the Chart Design tab. 3. 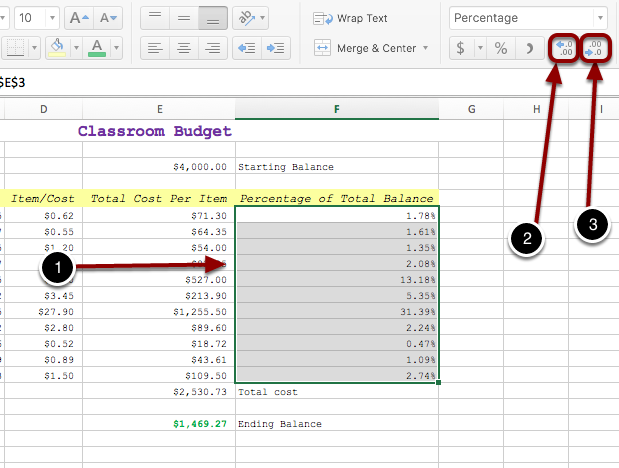 Select the option to Add Chart Element. 4. 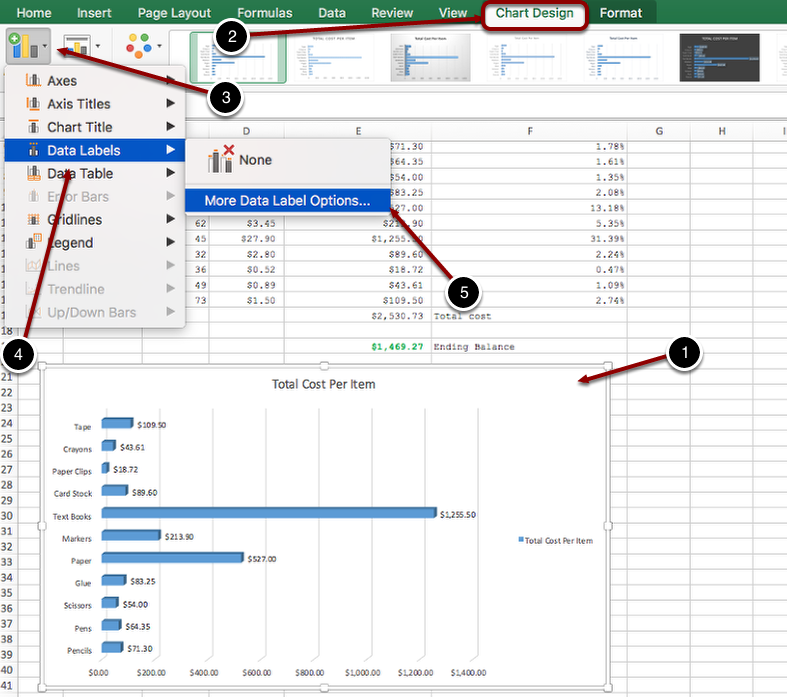 Select Data Labels option. 5. Select the "More Data Label Options..."
3. Select the Quick Layout option. 4. 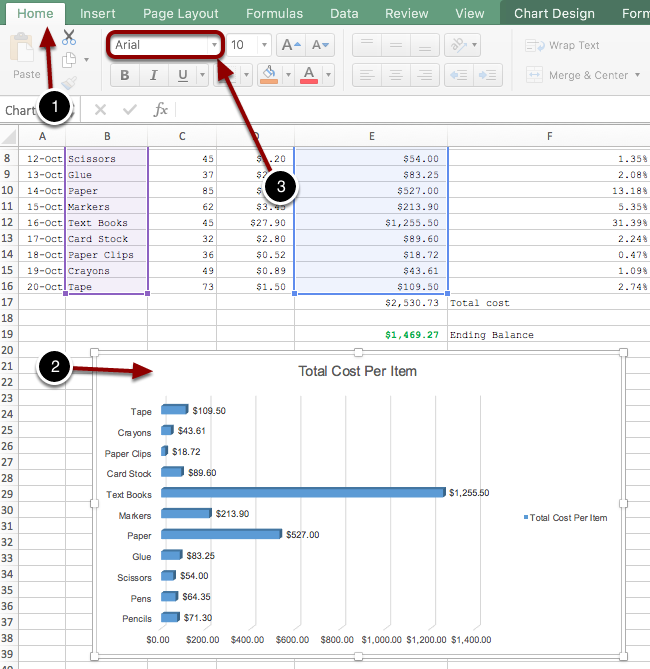 Select the option that shows the legend on the right of the chart. 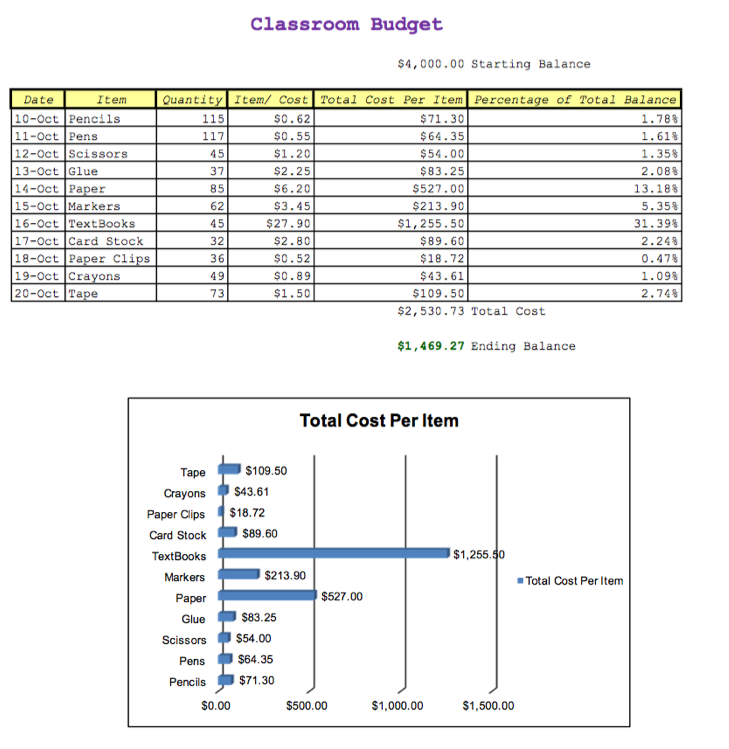 Change all of the text in the chart to Arial. 2. Click on the chart. 3. Select the font you want by selecting the icon shown above. Prev: How Do I Create An Audio Narration Of A Powerpoint? 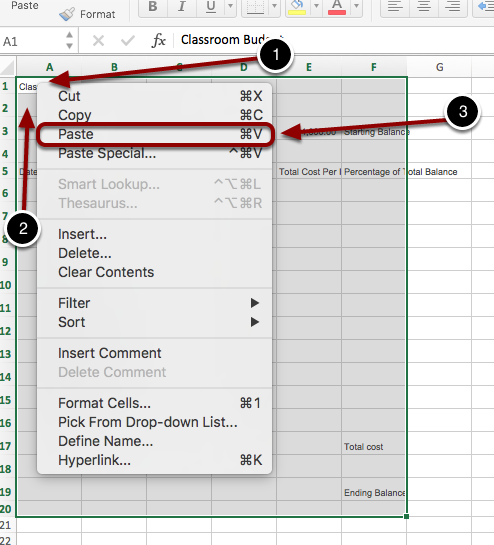 Next: How Do I Copy And Paste Content Into Excel?